The Eyes is a pair of galaxies (NGC 4435 and NGC 4438) in the constellation of Virgo at RA 12hr 27min 45.6s and DEC +13deg 0min 31s. They are 52 million light years away and part of the Virgo cluster of galaxies. 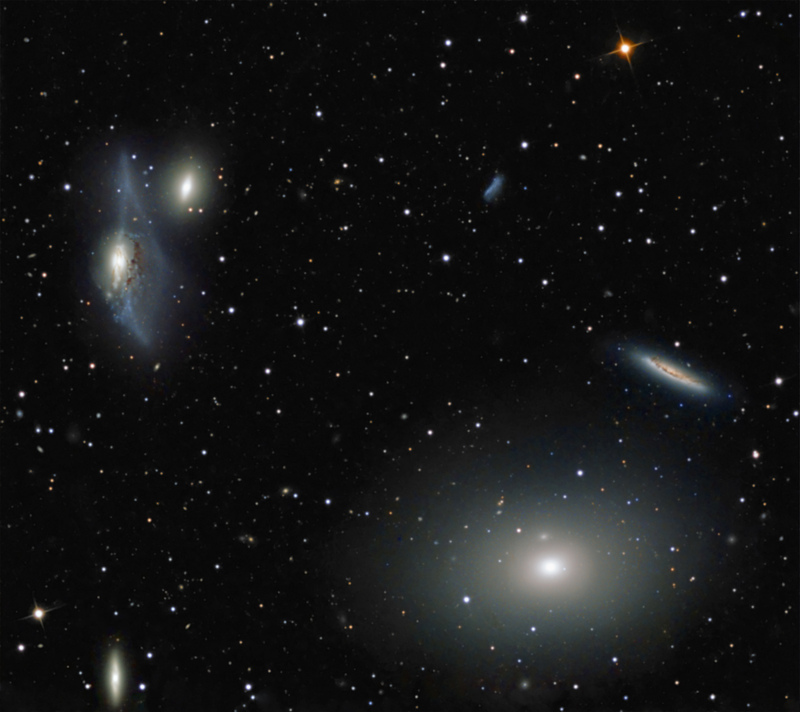 They are also known as Arp 120 for the distinctive distortion of NGC 4438, most likely caused by an recent collision with the massive M86 elliptical galaxy also shown in the image. Researchers recently discovered huge tendrils of ionized hydrogen stretching 400,000 light years from M86 to NGC 4438 (http://www.noao.edu/outreach/press/pr08/pr0807.html). This work suggests that high velocity collisions such as this may be sufficient to heat up gas so that new stars are not as easily formed. It may help to explain the absence of new star formation in giant elliptical galaxies, so that such a phenomenon is not totally predicated on the presence of a supermassive black hole. An annotated image is presented below. North is up and toward the right. The image width is ~40′.